Spices are used in different forms: whole, chopped, ground, roasted, sautéed, fried, and as topping. They blend food to extract the nutrients and bind them in a palatable form. Some spices are added at the end as a flavouring and are typically heated in a pan with ghee or cooking oil before being added to a dish. Lighter spices are added last, and spices with strong flavour should be added first. “Curry” refers to any dish in Indian cuisine that contains several spices blended together, whether dry or with a gravy base. However, it also refers to Curry leaves, commonly used in South Indian cuisine. Black cardamom काली इलायची kāli ilāyachī Very earthy and darkly aromatic. A much used in North Indian curries. Black Pepper काली मिर्च kālī mirch Largest producer is the southern Indian state of Kerala. Curry Tree or Sweet Neem Leaf करीपत्ता / कढ़ीपत्ता karīpattā/kaḍhīpattā Cannot retain flavour when dried. Only use fresh. Garam masala गरम मसाला garam masālā Blend of 8+ spices. Each family has their own secret recipe. Green cardamom छोटी इलाइची chhoṭī ilāichī Malabar variety is native to Kerala. Panch Phoron पञ्च फोरन pañch phoran This is a Bengali spice mix that combines fennel seeds, cumin seeds, fenugreek seeds, mustard seeds and nigella seeds. Saffron केसर / जाफरान kesar/jāpharān World’s most expensive spice. Flavouring for rice. 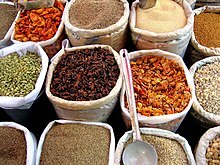 “Spices List – Indian Names”. TheSpiceMarket. Retrieved 2 October 2013. “Glossary Pakistani & Indian Spices (Masala)”. Direct Advert Media LLC. Retrieved 2 October 2013. “Glossary of Food Ingredients”. Cymran LLC. Retrieved 2 October 2013. “Glossary of Spices & Condiments – Indian Names”. Syvum Technologies Inc. Retrieved 2 October 2013. Raghavan, Susheela (2006). Handbook of Spices, Seasonings, and Flavorings (2nd ed.). Hoboken: CRC Press. ISBN 9781420004366.